Water Bears EDU is a 3D puzzle game for the iPad®, designed to enhance systems thinking skills in middle school students. The developers from Schell Games were delighted to make a game that is not only fun and entertaining, but that fundamentally helps educators involved in teaching STEM subjects. In the article below, Jason Pratt (JP), Francisco Souki (FS) and Dan Lin (DL), who all served as directors on the project, took some time to reflect on the development of the game and their hopes for its future. What was your role on the Water Bears EDU project? JP: I was the Project Director and Engineering Director of Water Bears EDU. I was responsible for maintaining the creative vision for the game and overseeing technical aspects of the project. I also got to write some code when I could find the time. FS: I was the Design Director. It means that, among other things, I designed most of the puzzles in the game and made sure they ramped up satisfyingly in terms of fun, challenge level and exposure to the right educational content. DL: I was the Art Director. There were two artists on the team including me, so I was in charge of the character design, the environment design, the object design, and the visual effects in the game. What was your biggest challenge in developing the game? FS: I’m colorblind, so all the color mixing puzzles were a little more challenging than normal. I’m serious! The biggest challenge, however, was designing Water Bears to be a game that players can love for how fun it is and teachers can love for how well it fits the classroom. 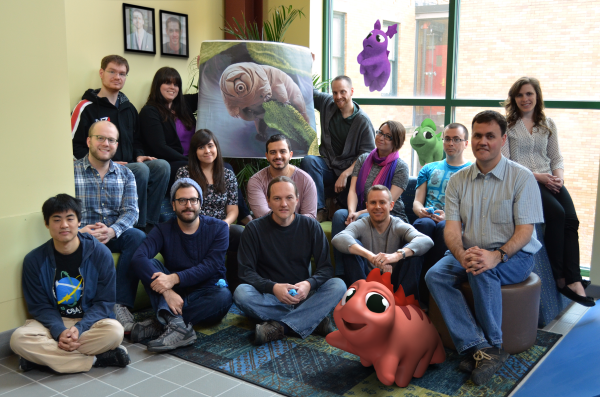 Our goal was always to make a game that kids (and everyone else, really) would want to play at home, on their own time. DL: The biggest challenge I would have to say are the pipes. Visually I had to make sure the pipe’s shape expressed their functionality. There were also problems with the amount of pipes that I had to optimize for. Is there a specific element of the game of which you are most proud? If so, what is it? JP: I love the whole game so much that it’s hard to pick a favorite part. I am really proud of all the little decisions that we made along the way, though. We made Water Bears EDU on a relatively tight timeline and budget. We didn’t have the luxury of second-guessing many choices once they were made. There were all kinds of potential features that we cut right off the bat because we knew we had to stay focused and keep things simple, but at the same time there were little things that we added pretty late that really tie the whole game together. FS: I’m proud of all the different kinds of levels we were able to add to the game. Water Bears only has a few core game mechanics, but we still found ways to use them in unexpected ways to surprise players up until the very end of the game. To do that we had to do, we got really close to our subject matter. I found inspiration for all sorts of new puzzles from getting really familiar with all the Systems Thinking concepts. DL: I’m really happy how the water bears ended up. There was a lot of collaboration in creating them and it couldn’t have been done without the whole team! Describe your feelings now that Water Bears EDU is ready for prime time. JP: I’m incredibly relieved to be done with development, and at the same time full of anticipation and anxiety waiting to see how the game is received out in the wild. I just can’t wait. FS: I’m thrilled that everyone will get to enjoy the magic that is tapping a water bear and watching it do a little dance. DL: Excited! I hope students have a great time with the game! What do you think students will like most about playing Water Bears EDU? JP: The core of the game is the puzzles, so I really hope that students can connect to the puzzles and find themselves challenged, intrigued, and amused by them. We fully expect different students to be drawn to different kinds of puzzles and to approach the solutions from different perspectives. One of the most important learning opportunities actually comes from comparing different solutions and understanding how those different approaches can be applied to working with systems in the real world. FS: Well, I don’t have to guess… I have data! They will like: 1. The water bears 2. The art style and 3. Getting creative with pipe configurations. DL: I think the best moment for students will be finishing a hard level after a long time and having all the water bears celebrate as the level completes. Water Bears EDU was built by Schell Games in collaboration with the Creativity Labs at Indiana University and is based on a prototype funded by the MacArthur Foundation. The game comes with real-time reports, a teacher’s guide, and sample lesson plans that can easily complement or supplement your existing curriculum. It’s now available on GlassLab Games!